Is a Necessary Being Really Necessary? Are Beliefs Separate From Knowledge? Looking for Real News? Let the Reader Beware. It is astonishing that while Graeco-Roman historians have been growing in confidence, the twentieth-century study of the Gospel narratives, starting from no less promising material, has taken so gloomy a turn in the development of form-criticism that the more advanced exponents of it apparently maintain—so far as an amateur can understand the matter—that the historical Christ is unknowable and the history of his mission cannot be written. This seems very curious when one compares the case for the best-known contemporary of Christ, who like Christ is a well-documented figure—Tiberius Caesar. The story of his reign is known from four sources, the Annals of Tacitus and the biography of Suetonius, written some eighty or ninety years later, the brief contemporary record of Velleius Paterculus, and the third-century history of Cassius Dio. These disagree amongst themselves in the wildest possible fashion, both in major matters of political action or motive and in specific details of minor events. Everyone would admit that Tacitus is the best of all the sources, and yet no serious modern historian would accept at face value the majority of the statements of Tacitus about the motives of Tiberius.' But this does not prevent the belief that the material of Tacitus can be used to write a history of Tiberius. The divergences between the synoptic gospels, or between them and the Fourth Gospel, are no worse than the contradictions in the Tiberius material." A.N. Sherwin-White. Aspects of Roman Citizenship and the Question of Historicity. 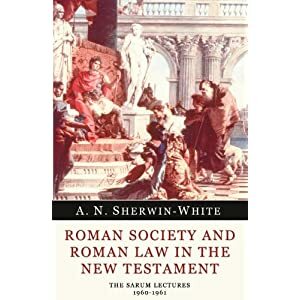 Roman Society and Roman Law in the New Testament. (Eugene OR: Wipf & Stock Publishers, 204) 187-188. Do you happen to know if Sherwin-White died a Christian? 'Consider just the four most extensive sources that we have for the life of the emperor Tiberius: Paterculus, Tacitus, Suetonius, and Cassius Dio. All four authors obtain their material from a much broader range of sources, rather than simply copy from each other, they write in a far more diverse range of styles, and yet they independently corroborate each other’s claims. Paterculus is an eyewitness historian writing a brief universal history of the known world, which concludes with Tiberius’ military campaigns (which he himself took part in). Tacitus is writing a year-by-year annalistic history of the Julio-Claudian period, but rather than just copy Paterculus for Tiberius, he instead draws from a whole array of authors who wrote during the Julio-Claudian period, as well as public records and other sources. Suetonius, who is writing almost at the same time as Tacitus, does not produce a carbon copy of his Annals, and very likely does not rely on Tacitus as a source at all (as argued by Tristan Power in “Suetonius’ Tacitus”), but instead writes a historical biography, not in chronological order, that is very different from the earlier sources in its style. And yet, Suetonius independently corroborates the claims of these earlier authors. Dio, who is writing a full history of Rome from its foundation in Greek prose, a different language than the earlier Latin sources, has only one part of his massive history dealing with Tiberius. Dio probably used Tacitus, but also many other earlier sources, and writes his own unique narrative that is still consistent with the other independent sources.